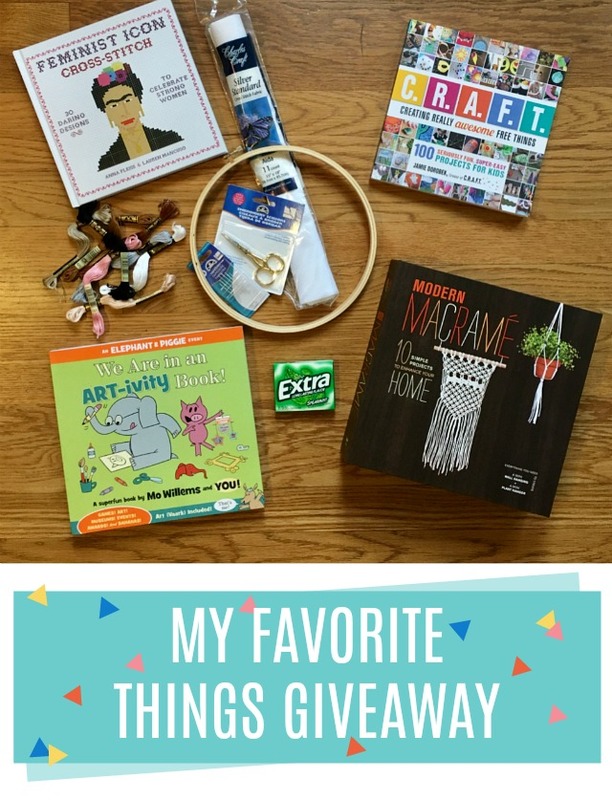 My Favorite Things Giveaway! - C.R.A.F.T. The countdown to Christmas is officially here, and today is the day for my 4th annual My Favorite Things Giveaway! (Just for fun, here is last years giveaway.) 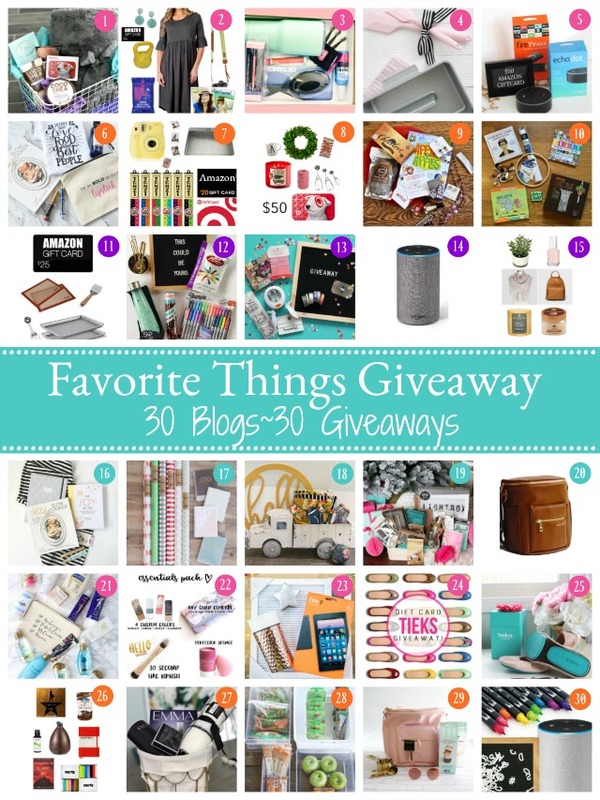 I joined 30 creative bloggers to share our favorite things, and each of us is hosting a giveaway. That means 30 winners total! Not only is it a fun prospect to win, but they make great ideas for holiday shopping as well. I’ve got 2 craft kits, 2 really fun books for kids, and of course, green Extra gum. Make sure you scroll down to the very bottom of this post to enter my giveaway and for deets on each of the goodies! What you need to do is make sure you HOP to each of our sites to enter to win the giveaway on each site. Yes, that’s 30 in all, but you’ve got a week to do it…plenty of time! While you are there, we challenge you to click around to see what they have to share, you may just love them as much as we do! 3. Modern Macrame: Macrame is back and better than ever! Modern Macrame comes with all the materials you need to make two projects–a mini plant hanger and a mini wall hanging–this fabulous kit also features an illustrated book with instructions for ten sophisticated projects. 4. 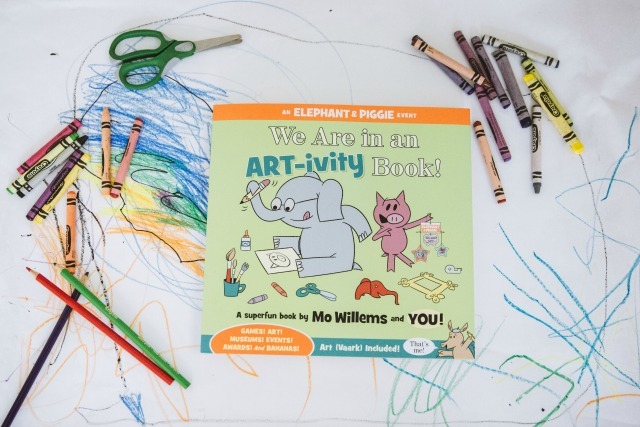 We Are in an ART-ivity Book: Elephant and Piggie are famous duo in our house (we even turned then into pumpkins) and when my 3 year old discovered their new ART-ivity book he was sold! It’s such a fun book! 5. Green Extra Gum: (10 packs for $7.30 = Best deal ever!) Because it is the best gum in the history of ever. Favorite Christmas movie has to be National Lampoons Christmas Vacation! My favorite Christmas movie is White Christmas. I would watch it every year with my mom when I was a kid. Definitely. Home Alone. I watch it every year with my family. Favorite Christmas movie is definitely Love Actually! My favorite Christmas movie is National Lampoon Christmas vacation. Thanks! I think my favorite Christmas movie would be Frosty the Snowman. Thanks for the great giveaway! Top of my list is It’s A Wonderful Life. My favorite Christmas movie is It’s a wonderful Life. Thank you for offering this package! I love elephant and piggie! My all time favorite is a Christmas Story, it’s a family tradition. I have to watch A Christmas Story every year. Love that movie! My favorite Christmas movie is “It’s a Wonderful Life”. Watch it every year! It’s a Wonderful Life will always and forever be my favorite Christmas movie although there are many others that I love. Favorite christmas movie is Bad Santa! My favorite is the original (cartoon) How the Grinch Stole Christmas! I have always loved Home Alone; I remember going to the movie theater with my twin brother and parents to see it. That’s one of my faves too!!! My favorite Christmas movie is “It’s a Wonderful Life.” Classic. I do like several Christmas movies, but if I need to pick just one, it would be ‘White Christmas’! I would watch this movie anytime! I tried but I can’t choose just one. I love all of the animated shows that I grew up with, as well as, A Christmas Story, Christmas Vacation, an Elf. A Christmas Story is my favorite movie. My absolute favorite Christmas movie is Rudolph the Red Nosed Reindeer! I watch it every year and now i watch it with my own kids!! Something about The Little Drummer Boy always gets me. My favorite Christmas movie is National Lampoon’s Christmas Vacation. My favorite Christmas movie is The Santa Clause. The Grinch movie is the best! My favorite is Rudolph the Red Nosed Reindeer. My significant other always tells me every Christmas season; that Rudolph and Clarisse are him and I . Every year he always brings a new set of the two home for me. My fave Christmas movie is hands down “Elf”!! Thank You for being a part of these giveaways!!! My favorite Christmas movie is “Christmas In Connecticut” starring Barbara Stanwyck. You’ll shoot your eye out kid…LOVE Christmas Story – Classic christmas movie watched every year! I’m a total traditionalist. I love Holiday Inn and White Christmas! My favorite christmas movie is, Christmas vacation and rudolph the rednose reindeer. Oh, that’s a tough one! I love “How the Grinch Stole Christmas” and Elf. But, I’ll sit down and watch most any of them. My favorite Christmas movie is A Charlie Brown Christmas. I have two favorites…..The Holiday and my favorite classic is It’s a Wonderful Life. National lampoons Christmas vacation is my favorite Christmas movie. We love to watch ELF at our house…and Polar Express is still a favorite too. I am excited about this prize! Creativity brings joy to my heart. It fulfills a part of my soul. My favorite Christmas movie is How the Grinch Stole Christmas. Elf, Miracle on 34th Street and The Christmas Story. It’s probably a tie between White Christmas and Elf! I love The Shop Around the Corner by Ernst Lubitsch. Me and my little Chloe Pearl are big fans of Elf! Yikes, can’t pick just one! Here are my favs to watch while wrapping presents on Christmas Eve/Day: Meet Me In St. Louis, Christmas in Connecticut, The Man Who Came To Dinner, & of course A Christmas Carol. Thx for the chance!! The Holiday and Love Actually and White Christmas and a 90’s cartoon called Anabelle’s Wish about a cow who wishes to be a reindeer. I love them all, but for the sake of choosing, I’ll say White Christmas! My favorite Christmas movie is It’s a wonderful life. My favorite is Christmas in Connecticut!!! That’s a hard one I’m a Christmas movieaholic it’s probably easier to pick my least favorite which is A Christmas Story. I remember when i was a little girl they showed the Wizard of Oz during the time they showed the christmas shows and that was my favorite Christmas time show than I know ots not considered a Christmas movie but to me I was more excited about it coming on because they only showed it once a year at that time that is my all time favorite movie of all movies. But if I had to choose 1 Christmas movie it would be The Santa Clause. Crazy that Wizard of Oz was on during Christmas time! If anything, I would think it would be more of a Halloween movie! While I love a lot of Christmas movies, my favorite will always be Home Alone. Elf for all the laughs it brings and While you Were Sleeping for a good reminder of the importance of family. ELF is my favorite movie!! Thanks so much for the giveaway! Right now my TV is on the Hallmark Channel 24/7!! Love all their Christmas movies! It’s a toss up between Holiday Inn and White Christmas. They are very similar and I love them both for different reasons. My favorite Christmas movie is The Santa Clause. Thanks. This is a movie I watch every Christmas for like the past 6 years… Love Actually!! ELF and Chevy Chase’s Christmas Vacation are my ALL time favorites! A Christmas movie that I can watch over and over again is Four Christmases. A tough one. I think it has to be either The Nativity Story or the Santa Clause trilogy, but I love all Christmas movies! Elf for SURE!! But Love Love almost all Christmas movies! I really do not have a Christmas favorite. I am dying to watch Elf someday tho! My favorite is “A Christmas Story”. Love Actually and Die Hard are probably my favorite Christmas movies. I love any mushy, loving, holiday hallmark movies. But my all-time favorite is Rudolf the Red Nose Reindeer! It’s difficult to pick a favorite Christmas movie so I’ll pick the animated Rudolf the red nosed reindeer. It’s a toss up between Elf and A Christmas Story…they’re both great! I love watching the classic Rankin Bass movies with the puppets, like Rudolph the Red Nose Reindeer, The Year Without A Santa Clause, etc.